Using wallpaper to back bookcases is such an easy and inexpensive way to give a room a hit of color and pattern! And as we saw with Paige Minear’s Library and Eddie Ross’s Living Room, wallpaper is a fantastic way to elevate dark paneling or “off the rack” shelves in minutes…. So when Kim, one of our dear readers, showed us how she transformed her very own bookcase at home, we had to feature her DIY Wallpaper Design Project! This stylish, hardworking single mother has fabulous taste and knows how to design on a dime. She also happens to be the miracle worker that’s been making the shaggy gray mop on my head look like hair for years – so it’s no surprise she can freshen up “tired, out-of-date” things! Ladies, if you ever are in RVA, go to Mango Salon, ask for Kimberly Andrews and watch your day get better! We love how she took a bookcase she already owned and made it a showstopper. See below! Other combinations we love…We’re dying to see these bookcases backed with one of these papers! 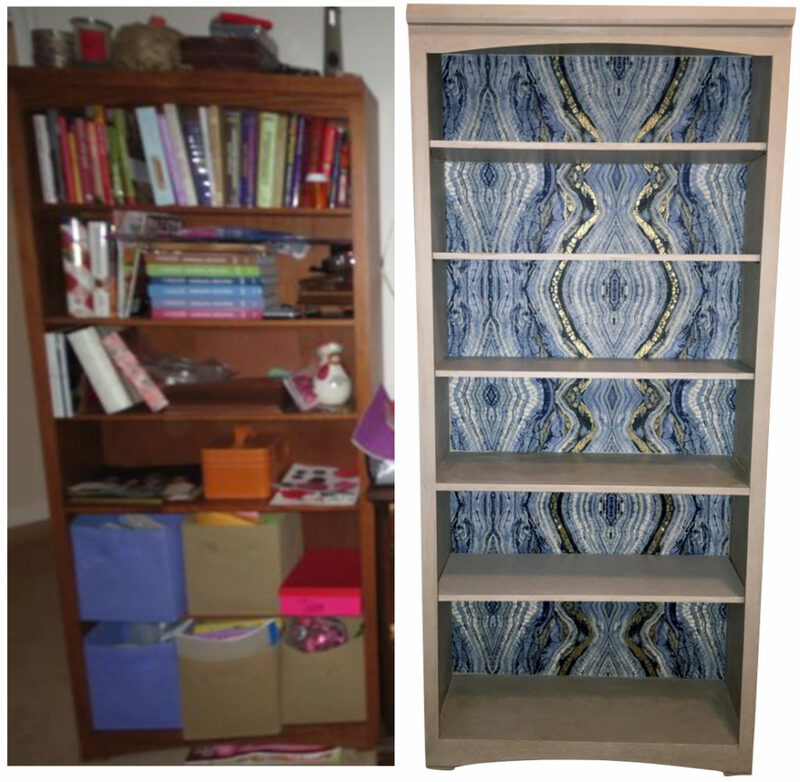 Some of our favorite wallpapers can be found here and here, so grab a roll or a remnant and give a bookcase an update the way Kim did! And if you have your own DIY Design project that you want to share and see published on Hanover Avenue, here is how to submit your magic!